I love the Vanilla Scones at Starbucks. The thing is, there is not a single solitary Starbucks in my entire town. NOT ONE! Hard to believe, I know, but alas, I suffer. That is when I decided that I had to come up with a recipe to make these at home! Now these are not the prettiest scones you will ever see, but I promise you they are tasty! I can't wait to show you how I did it so let's get started! To begin your scones, take your pairing knife and cut the pod in half. Then using the back of your knife, scrape out the caviar from the pod. Add the vanilla beans to the whole milk. Now combine the flour, sugar, baking powder, and salt in a sifter. Sift the flour mixture into a bowl. Add the COLD butter to the flour mixture. Using a dough cutter or butter knives, cut the butter into the dough. You will know it is ready when it resembles wet sand and holds together when you squeeze it. To your milk and vanilla beans, add one egg and beat. Our the milk into the flour mixture. Next mix together until combined. Now you can turn the dough out onto a floured surface and roll out in a rectangle shape that is 1 inch thick. Now cut the rectangular dough into three columns from top to bottom. Then cut into 9 squares by cutting from side to side. Next cut each square into 2 triangles. Place on a baking sheet lined with parchment paper or a baking mat. Place in a 350 degree oven and bake for 18-20 min. Once the scones are cool, you can make the glaze. To the milk add the vanilla beans from the other pod. Pour the milk into the powdered sugar and whisk together till smooth. Dip the scones into the glaze. Place on a cooling rack that are on baking sheets to catch the drippings. Let the glaze set completely . Cut the vanilla bean in half and, using the back of the knife, scrape the seeds out of the pod and add to the milk for your scones. Add the cold butter to the flour and, using a dough cutter or butter knives cut the butter into the flour. You will know that the flour is ready when it resembles wet sand and it holds its shape when you squeeze it. To the milk add the egg and beat. Pour the milk and egg mixture into the flour and mix together. Pour out the dough onto a floured surface and roll out into a rectangular shape. From top to bottom, cut the dough into three columns. Then into 9 squares from side to side. Now cut the squares into two triangles. Place on a parchment or baking mat lined baking sheet. Place in a 350 degree oven and bake for 20 minutes. Place on a cooling rack until they are cool. For the glaze, add the seeds of the other vanilla pod to the milk. Add the milk to the powdered sugar and whisk until smooth. Dip each scone into the glaze. Place on a cooling rack that is on top of a baking sheet until the glaze sets. 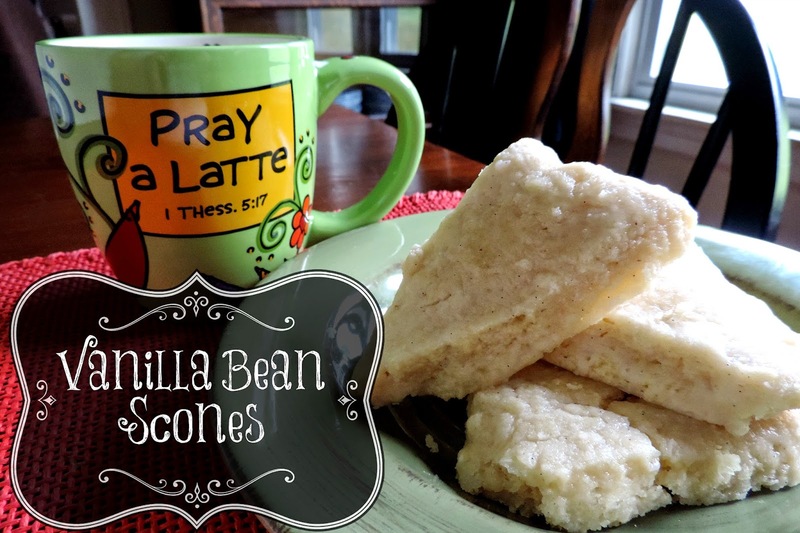 Serve with your favorite coffee and ENJOY!